Dominik Stary lines up a groundstroke. 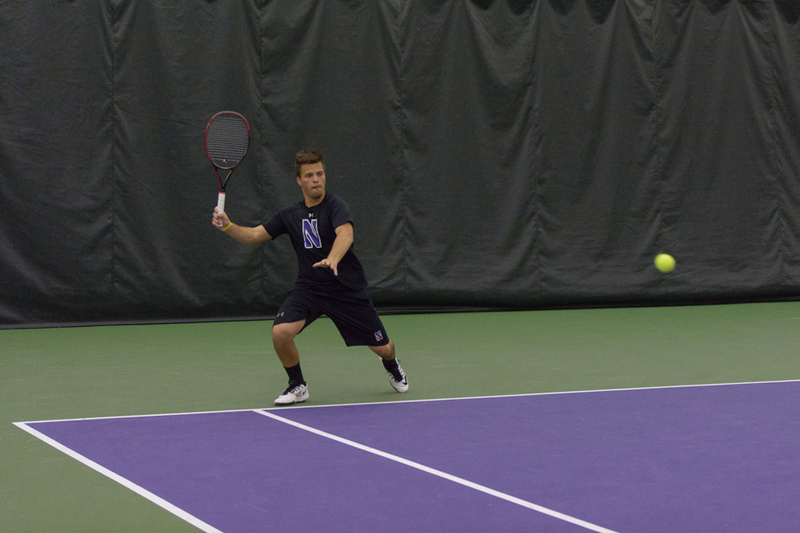 The sophomore will hope to lead Northwestern in some tough matchups this weekend at the ITA Regional. Nine times, Northwestern has faced off against Oklahoma. Nine times, the Wildcats have been on the losing end. No team has beaten NU more often without taking a loss in the history of the program. The Cats (1-1) will travel to Norman, home of the No. 18 Sooners (5-0), this weekend to play two matches as part of a four-team, tournament-style ITA Kickoff Event — with the winner earning a spot in the ITA Indoor Championships in February. Depending on the result of the first match, NU will then play either No. 16 Illinois or Georgia Tech (3-1) on Sunday. The regional placement was decided based on a draft. The top 15 teams from last season have the opportunity to host a regional, and the full draft order for placement is determined by the rankings at the end of last season. Coach Arvid Swan had the seventh pick in the draft and was the third coach to choose to play at Oklahoma, a team that finished ranked No. 13 and was one of the lower-ranked hosts. Swan said another appeal was the indoor location that would be similar to the environment the Cats practice in for most of the year. The last time NU played in Norman was in 2015, and while none of the members of this year’s team were in on that squad, this will be the third time in the last five years the Cats will play at the Oklahoma regional of the ITA kickoff. However, the Sooners are a familiar opponent even to these players. Last year, the Cats lost a 4-3 nailbiter that went down to a third set tiebreaker in the deciding match. In that match, which was played at last year’s ITA Indoor Championship, NU’s loss in the doubles point played a critical role. Winning two of three doubles sets gives a team the first point of the match before singles play begins and can provide critical momentum. Doubles has been a focus for the team early in this season after a loss in the doubles point hurt the team in a 4-3 defeat to North Carolina State. Freshman Antonioni Fasano said doubles requires having more energy and confidence than in singles play. Fasano and his partner, fellow freshman Nick Brookes, struggled in their first two doubles sets at the No. 2 spot, losing 6-3 to both the Wolfpack and Boise State. However, Fasano is optimistic that as the new pair plays with each other more, their synergy will improve. Along with Fasano and Brookes, junior Ben Vandixhorn and sophomore Dominik Stary have had an up-and-down start at the No. 1 doubles spot in their first year competing together. Getting an early boost from the doubles point could be key as the Cats head into two competitive matches where they will need every edge they can get.